This step-by-step guide to medical technology innovation, now in full color, has been rewritten to reflect recent trends of industry globalization and value-conscious healthcare. Written by a team of medical, engineering, and business experts, the authors provide a comprehensive resource that leads students, researchers, and entrepreneurs through a proven process for the identification, invention, and implementation of new solutions. Case studies on innovative products from around the world, successes and failures, practical advice, and end-of-chapter 'Getting Started' sections encourage readers to learn from real projects and apply important lessons to their own work. 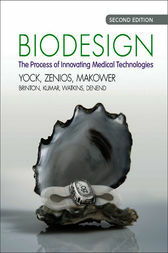 A wealth of additional material supports the book, including a collection of nearly one hundred videos created for the second edition, active links to external websites, supplementary appendices, and timely updates on the companion website at ebiodesign.org. Readers can access this material quickly, easily, and at the most relevant point in the text from within the ebook.